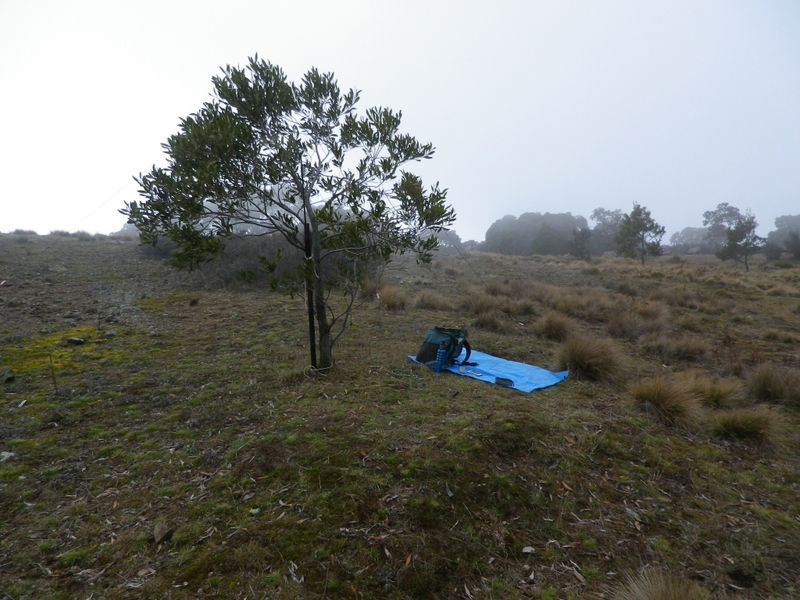 As part of a trip from Canberra to Brisbane in late June 2015 I visited Mt Canobolas for a SOTA activation and added it to various tallies, including S2S and the 6/10m challenge. My route to Orange was from Yass via Boorowa, Cowra and Canowindra. Near Orange there was a turnoff to “Old Canobolas Road” but I had planned to use the “new” Canobolas road and continued on a few more km. It was a straightforward trip up to the summit on a good road, no problem at all for the Ford sedan I was driving. At the summit there are several buildings, parking areas, and a trig point in the standard NSW geodetic survey shape of a four-sided concrete pyramid. The summit was in cloud. Here is a detailed picture of the situation. For better photos see Gerard’s blog. He had the sense to visit in fine weather! I decided to keep away from the buildings and set up to the west side of the road and downhill somewhat. I think my operating position was close to where Gerard VK2IO operated. After a number of contacts on 40m I wanted to try 10m and 6m. Phil VK2JDL was on another summit and we tried to make a contact on 10m. Despite being relatively close signals were just too weak. Then I tuned around on 10m and found VK6JR/p in the Kimberly region, running a 10w converted CB rig chatting to VK5s and VK3s. I heard him say he was about to close down but I called him and was successful in making the contact though he was not receiving a big signal from me. No problem with low signal reports, getting the contact in the log is the goal. I called on the local 2m fm repeater without any response. I used my phone to look at the club website to find out the sub-tone requirements and the frequency for the repeater. I set my FT817 to use sub-tone and that should have worked ok. The repeater was keying up, but I was unsure whether my audio was getting through. I regretted not taking my hand held IC-V85 which I know is preprogrammed with the 91.5 Hz. (And I could have used the other radio to confirm I was getting into and successfully using the repeater. ) Actually, with two radios I could have had a contact with myself, even using different callsigns for each radio. Just have to be sure no-one was watching because that would have been a strange sight! No locals returned my call which meant I could not ask them to give me contacts on 6m. Weekdays are usually a lottery for visitors to country areas hoping for repeater contacts. No surprises. After all this I had used up my planned time and I packed up and headed for my overnight stop at Coonabarabran.